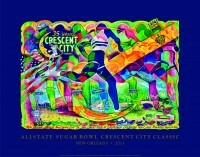 Back by popular demand, Tuna Seither designed this year’s Commemorative Crescent City Classic print. The high-quality silk screen features a unique design commemorating the 35th anniversary of the Allstate Sugar Bowl Crescent City Classic. A Limited Edition of 100 Artist’s Proofs are available exclusively through Tuna. Tuna has a rich history with the Crescent City Classic. He has created more prints than any other artist in Crescent City Classic history, including the 25th and 30th Anniversary prints. It was only fitting that he created the 35th Anniversary print as well. Adorned with Tuna’s signature Pel Lis Can character standing at the finish line, the print combines the story of the Classic with the story of New Orleans. The print features an America flag flying high above both the City’s landmarks and the emblem on Louisiana’s state seal. A crowd of runners and, of course, the crescent moon focal point provide a decorative celebration of color – a defining Tuna Seither trademark. Tuna said the 35th Anniversary print looks totally different from any of his other CCC prints, a very deliberative approach for him. On the heals of creating the MVP trophy for the New Orleans Bowl, Tuna said he was honored to create the 35th Anniversary print and is already dreaming of the chance to create the 40th Crescent City Classic commemorative print. To request your Crescent City Classic Artist’s Proof and choose your number, contact Tuna at tunaart@cox.net. 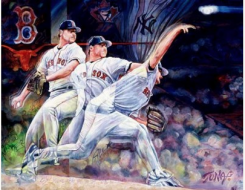 The artist will personalize your Artist Proof upon request.